Most Honored Sir — I want to know if it is a crime to wear a beard? I suppose that this may appear to be a foolish question to you, but to me it means a great deal. I am the pastor of St. Nicholas Greek Orthodox church on Pacific street, Brooklyn, and my profession calls for the wearing of a beard. When I got out on the street the boys and young men mistake me for a Jewish rabbi and insult and assault me. I have borne the insults and assaults patiently up to last Saturday night, when an incident occured that made me lose all patience. I was alighting from a car at Seventy-third street and Thirteenth avenue, Brooklyn, when a little loafer hit me with a decayed vegetable, which I believe was a more than ripe tomato. This exhausted my patience. I went for the lad, who, luckily for him, escaped. Yes, if they assault you, and throw cans at you, you have a right to defend yourself to the last extremity; but if you find it necessary I will have a detective go around with you for a few days until we arrest some of those who are wronging you. Are you certain that it is your beard which is the cause of the trouble? The clergyman will be a striking figure with his tall, shiny hat and ruddy face almost hidden by the luxuriance of his black beard. It is not of such a length, being very neat in its trimming, but it is so abundant that only mere patches of the priest’s red cheeks show above it. Softly behind Father Kerbawy will tread a sleuth ready to promptly pounce upon the first person long the way who shies sticks, stones, objurgation, tomato, or even a spitball at the worthy priest. 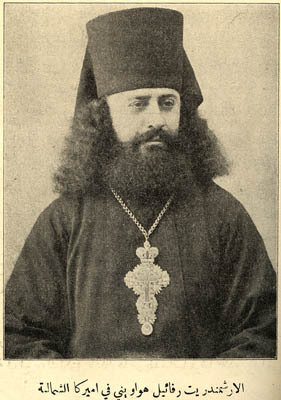 Of course, Kerbawy’s bishop was St. Raphael Hawaweeny, who, in 1895, had arrived in America with a bushy beard and a rather wild head of hair (see above). But, as we saw on Monday, Raphael soon changed his appearance, cutting his hair, trimming his beard, and, outside of the church, trading his cassock for a suit and collar. In 1904, he told the New York Sun (5/22/1904), “I do not wish to attract attention by any peculiarities. There is no reason why I should be so extreme.” By the end of his life, St. Raphael looked like any other respectable gentleman a hundred years ago. In the early 20th century, beardless faces were much more common among Russian priests than among their Greek counterparts, who tended to have full beards until around the 1920s. But not all the Russians were thrilled with clean-shaven clergymen. Fr. 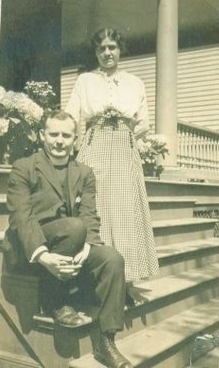 Joseph Stephanko, pastor of Ss. Peter & Paul Church in Passaic, New Jersey, dared to pick up a razor in 1913. A Russian-language newspaper in Jersey City accused Stephanko of “making void the Orthodox faith because he shaved himself.” The priest responded by filing a $25,000 libel suit against the paper (New York Times, 8/20/1914). A couple of years later, he was awarded $1,000 — a fraction of his original demand, but still a healthy chunk of change in the 1910s.